You've cleaned out your linen closet of all the unnecessary stuff, and it's still bulging and spilling out. 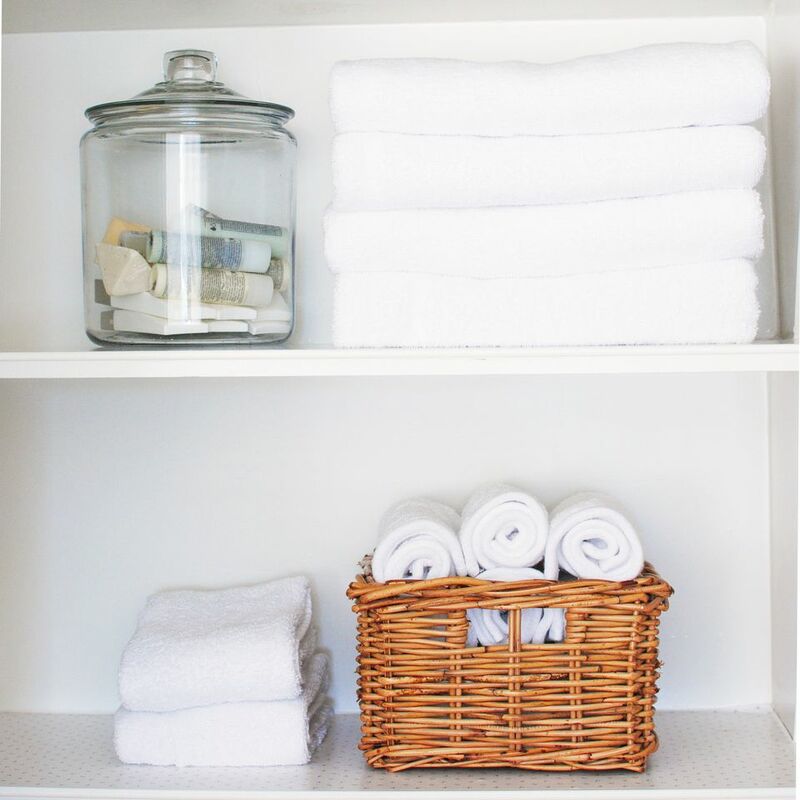 Luckily, there are some tips that will help with keeping your linen closet organized. Stack towels with the folded edge facing outward. This will make it easier to grasp and pull out without disturbing the rest of the stack. Place top and bottom sheets sets inside a coordinating pillow case to keep all pieces of a bedding set together. Stack smaller items like cleaning rags inside a canvas tote to keep them organized. As a rule, two sheet sets per bed in the home are plenty. It's only necessary to have two bath towel sets per person per week, as well. If you have vintage or antique linens that make their home in your linen cabinet but are not used, consider a new home for them. The height of your shelves will make a big difference in how efficient your linen cabinet storage is. For large blankets and seasonal items that should be stored on the top shelf of the linen closet, a height of 18 inches will be needed. For towels, 12 to 16 inches is the range that usually works best. For sheet sets and kitchen linens, consider a height of only 10 inches. If adjusting the height of your shelves isn't an option, use wire or plastic shelving inserts to create more efficient spacing. With so many beds and bathrooms in my home, one centrally located linen closet doesn't make sense. Kitchen linens are stored in the kitchen. Dining linens are stored in the dining room. Even some bed linens make their home in the specific room where they will be used. If your linen closet isn't working, consider moving linen storage into the room where those items will be used. Label the shelves in your linen closet with the items that belong in that stack. Use a label maker or slips of paper and tape. You can also color code your linens to the person or room where they belong. Place freshly laundered linens on the tops of the stack. To make sure that sets are used evenly, always pull linens from the bottom of the stack. Some people may like to do the opposite. You can put the newest linens on the bottom of the stack and take from the top of the stack when linens are needed. Do what works for you. Don't forget the two hidden storage areas of your linen closet. The bottom of the linen closet is a great place to store bins of bulky items, or a hand held vacuum cleaner. Consider using an over the door organizer to store smaller items or an over the door towel rack to store larger items like table linens.